Well, cheap is a relative term. After three years of consistently high oil and retail gasoline prices (averaging between $90-$105/barrel for West Texas crude) oil has suddenly hit an air pocket and it is getting economists excited and worried all at once. On the plus side, cheaper retail gas would be a nice bonus to consumers who have grown accustomed to paying $3.75/gallon for gas. However, the concern has to be what's driving this decline? Historically, a weaker global economy has led to lower prices and that is obviously not a good thing. * oil is at about it's lowest level since 2011. What we don't know have a good handle on is the role geopolitical maneuvers are having on the price. If the Saudis are trying to impact other major player through oversupply, we could be drawing conclusions from data that isn't representative of the facts. 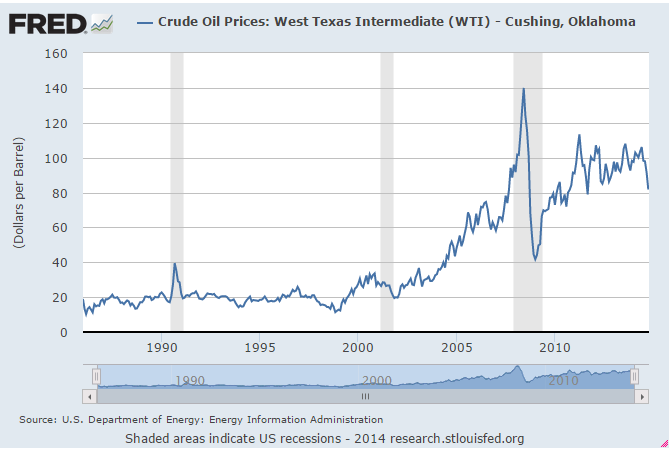 Finally, just a little perspective on all of this "cheap" oil via the Fed Reserve of St. Louis. Yes, oil is down to it's lowest levels in 3 years, but it's still 2-3 times higher than where it was for the previous 20 years. Overnight update: Global markets shrugged off the Chinese GDP data because we all know they are just making up the numbers at this point. However, a Reuters story which said an anonymous source indicated the ECB (Europe's Fed) was looking at buying bonds (ie, their version of QE) has sparked another monster rally in stocks this morning. To recap - stocks fell roughly 9% from their peak at the beginning of this month and have now jumped back up 5% in the last 4 days. This is a sign of the kind of volatility that says something big is afoot (or someone is making up for lost time by trading like a madman .... or a madcomputer).